The OAK, ACORN and SEEDLING on Ridge Road at Clear Lake is a beautiful lushly treed property with gorgeous Muskoka rock outcropping, sloping hills and charming periwinkle and moss-covered areas for kids to play in the sandbox or toss a ball. There are three small cottages and a boathouse included in this property rental with one kitchen in the Oak Cottage. Please do not hesitate to click on "CONTACT OWNER" for more details on available dates and amenities. The OAK COTTAGE which is the main cottage, is located at the water's edge. It has a wraparound DECK and a large screened MUSKOKA ROOM furnished in antique white wicker with a cupola and water views all round. An open LIVING, DINING, KITCHEN space spans the length of the OAK Cottage with a walkout to a full length DECK with wonderful lake views. The fully equipped KITCHEN has a wall of windows overlooking water for happy (hand) dish-washing. You can dine at the pine harvest in the dining area, at the table in the Muskoka Room, or on the deck which is furnished with umbrella table and wicker chairs and a propane BBQ. The LIVING ROOM is furnished with a queen sofa bed, soft seating, wicker and is accented with antiques and collectibles. There is a flat screen TV, sound dock and board games for a rainy day. Two charming QUEEN BEDROOMS have reverse ravine views of mossy rock formations. Each BEDROOM has a ceiling fan, double closet, dresser and mirror. The "Beach" bedroom also has space for a pack n' play. A renovated two-piece BATHROOM between the bedrooms has a Kohler pedestal sink and toilet and a spacious storage cabinet. A separate SHOWER ROOM off the Muskoka Room also houses the stacked washer/dryer. The rustic ACORN COTTAGE is on flat land above THE OAK, closer to the driveway. It is surrounded by periwinkle, lush trees and giant rocks and the views from every window are private and green. The ACORN COTTAGE has a screened MUSKOKA ROOM furnished in grey antique wicker. The “LIVING ROOM" with fieldstone fireplace is furnished with a double sofa bed to sleep two more, as well as two bunk beds. Perfect as a sitting room OR sleeping for four children. There is QUEEN BEDROOM with a wall of windows, a pine dresser and off the bedroom, a charming new three piece BATHROOM with shower. Note the bedroom and the living room in the ACORN are adjacent and relatively open. It suits one family or a ton of kids. THE SEEDLING cottage is a one bedroom bunkie with white-washed plank interior. It has a cathedral ceiling and is furnished with a double bed. There is space for a child's mattress or baby's bed in this bunkie as well.. Guests staying in THE SEEDLING use the three piece BATHROOM in the ACORN accessed through it's exterior door. At the LAKEFRONT there is a charming single slip BOATHOUSE filled with water toys and fishing gear. The DOCK angles out into the water providing a natural shallow-water area for small children at the shoreline. The water depth of 18" at the shoreline increases to approximately 10 feet at the dock and drops to 25 to 50 feet in the lake. The DOCK is furnished with Muskoka Chairs and is the perfect spot for your morning coffee, yoga, or afternoon cocktails. Beyond the dock is a SWIM DOCK with ladder, perfect for diving practice or a quiet nap. Evening activity can center around the FIRE PIT outside the ACORN cottage. Music, s'mores and sparklers while seated on the red Muskoka chairs or tree stumps, either in bathing suits or wrapped in blankets, is a great way to end to any day! Feel free to click on "CONTACT OWNER' to ask any specific questions about dates and amenities! We looked for many years to find the perfect cottage property that would allow our family to congregate even when they lived far away. Almost ten years ago we found that perfect spot on gorgeous Clear Lake at 1069 Ridge Road, right next door...Our kids all loved it, got married, had babies and came with their friends and our grandchildren. It was all wonderful until we didn't fit anymore...Happily in 2012 our lovely next door neighbors decided to sell their charming cottages at 1073 Ridge Road and we bought the property......We rent the OAK, ACORN and SEEDLING to people whom we feel will appreciate it's charm and history when our family can't be there to use it. The lay of the land at 1073 Ridge Road is just splendid. The combination of the trees and the rocks and mounds of periwinkle and the shining lake beyond is absolutely magical...We also love the view to the two private islands in Clear Lake in front of our properties...We've made many improvements to the property since we purchased it, but have retained that Old Muskoka feeling. The charcoal clapboard exteriors with white and red trim nestle into their wooded surroundings...The interiors are light and beach-y and are furnished with comfortable soft seating and new mattresses, along with interesting antiques, memorabilia and artwork...The Muskoka Rooms can be enjoyed in a downpour or allow a breeze on a hot summer day...The cottages are comfy and very pretty but the real star is CLEAR LAKE. Although many families on the lake have been cottaging on Clear Lake for a century, it remains a beautiful hidden gem. Only 1 1/4 miles long and less than a mile wide, it provides endless exploration in its bays and rocky shoreline. Camp Pinecrest occupies approximately 700 acres at the end of the lake and borders two other lakes. It's heavily treed and largely undeveloped areas ensure the beauty of the lake remains intact...The lake is alive with kayaks, canoes, paddle boards and paddle boats. There are motor boats and kids flying on tubes but the overall feeling of the lake is peace and joy and serenity. It is our greatest joy to spend time at the LAKE and we hope that our cottages will give your family and friends as much pleasure as it does ours! All bathrooms are well-supplied with towels and washcloths. Beach towels also provided. This property is located on over 100' of private waterfront on beautiful CLEAR LAKE between Bala and Gravenhurst in the Township of Muskoka Lakes. Pillows, quilts, blankets and towels are provided. Guest supply their own sheets and pillowcases. See list of bed sizes under bedroom descriptions. At road for four to five cars parallel. Please do not park in the driveway. Some spices, staples etc supplied. Please replenish what you use. Open concept kitchen in OAK COTTAGE. Electric range, full size fridge with freezer on top, double stainless sink, lots of storage, equipped for large a family. Full wall of windows with lake view!! Pine harvest table in the kitchen (with leaf in) seats 10-12. Pine table in Muskoka Room (with leaf in) seats 6-8. Dining table on the deck seat 6-8. Outside picnic table by the lake seats 6. Many floats, water seats, swim dock for water play, lifejackets of various sizes upon request. Many courses in the area. The place is clean, looks like recently renovated, beautifully designed, and very cozy. Warm and very comfortable atmosphere was carefully created by the owner - everything is made to ultimate relaxatoin and rest.fully stocked kitchen, rooms and beautiful deck to enjoy a great meal. Clean amazing water for swinging with a wrap around dock with all the water toys like kayaks , peddle boats, floties etc..also came well equipped with life jackets. 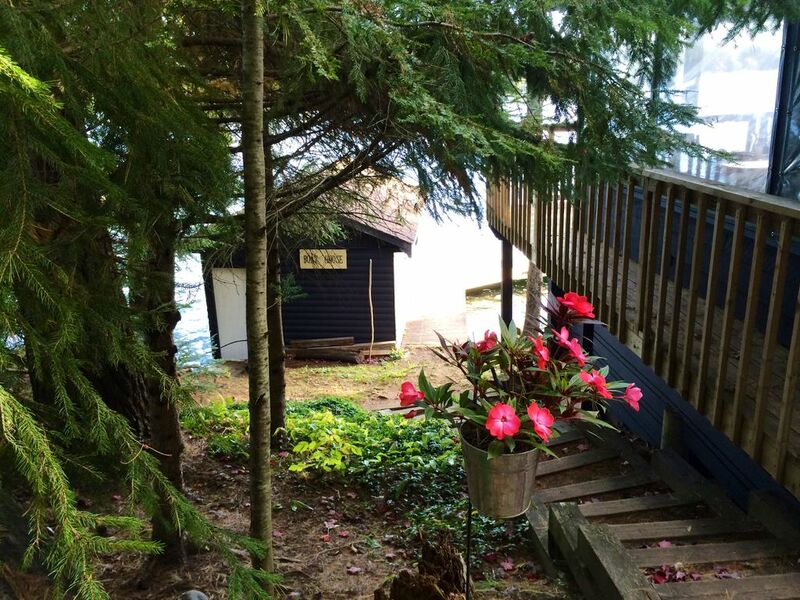 the owners Deborah and her husband are just amazing people very helpfull and punctual on replies.. would definitely rent this beautiful property again..
Pros: The cottage has comfy mattresses, the kitchen is well-equipped and the proximity to Clear Lake Brewery and Bala was great. And Clear Lake is nice for swimming. Cons: Lots of other cottages and docks close by so no privacy down by the water. The dock doesn’t get sun after 3 and the floating dock is in poor repair. Thank you for your review. Although the dock gets full sun from sunrise and throughout the day it drops behind the house in late afternoon particularly early in the season. We have purchased a new swim dock which will allow guests to paddle or swim out the extra 100 feet to sit in the sun until the evening hours...with good SPF of course!!! The property reminded all of us of childhood Muskoka memories but the thoughtful amenities, charming decoration and cleanliness of the Oaks cottage went beyond our expectations. Location to town and situation on the quiet lake was ideal for us. If your looking to recapture your child hood Muskoka memories in comfort and style book this property. We are so delighted that your stay at our Oak/Acorn/Seedling was enjoyable and hope you will return to visit us again! Thank you so much for noting the details in your kind review too! Clear Lake is a treasured family-oriented lake hidden just off Hwy 169 between Gravenhurst and Bala in the Township of Muskoka Lakes. Wildlife abounds in the rocky and treed surroundings of the four "roads" that lead into Clear Lake. The water which is clean and deep Is the perfect spot for an early morning paddle-boat ride with your coffee in hand. Or canoe or kayak along the shoreline and wave to the loons. A short walk to the corner of Southwood Road and 169 to Torrance Mercantile gets you your morning paper, a carton of milk and a loaf of bread. Or gourmet pizza at PIE. The town of Bala lies about 5 km up the road and has all the amenities you need including fudge, ice cream, the Country Butcher, The Beer Store, LCBO, antiques and a haircut. Port Carling, another 20 km by car, is the scene of many great galleries, restaurants and the site of the famous "Locks". Gravenhurst, about 25 km below us on 169, has a quaint main street with antiques, toy stores, restaurants and brewery, as well as a PC and Sobeys,, Canadian Tire, and even a Dollarama! The Muskoka Wharf complex in Gravenhurst is home to The Muskoka Steamship and Historic Society and the famous Sequin. There are many great golf courses in the area as well as other diverse sports and cultural activities to explore. Your rental week starts at 4:00 pm and ends at 11:00 am the following Friday to allow for inspection before new guests arrive. This is strictly a NON-SMOKING property. Please note our large LAkE HOUSE at 1069 Ridge Road (next door) is also available to rent for limited periods during the summer. Please check VRBO listing # 806609 for details on that property. Contact the owner directly regarding renting both properties together for a large family gathering.